Recently, Jim Higgins, Ed.D. and Patrick M Nooren, Ph.D. with Biddle Consulting Group, Inc. released an article in the EEO Insight publication title, "OFCCP's Compensation Directive 307: A Practical Review of How Federal Contractors Should Prepare for the OFCCP's New Compensation Directive". Drs. Higgins and Nooren mention in this article that the OFCCP is under growing pressure to identify and address systemic compensation systems/decisions that generate or perpetuate pay equity discrimination. Since the OFCCP has increased its budget and staff by 25% and 31% respectfully since 2009, the Obama Administration is expecting an increase in compensation audits, pay equity discrimination investigations and corresponding awards and penalties associated with systemic compensation issues. The authors state at the beginning of this timely document, "THE HEAT IS ON!" We agree with the authors and we have been advocates for the multi-compensable factors job evaluation and compensation systems for the past 28 years. Our proprietary 15 factors job evaluation system with weighted points by selected levels has developed thousands of job descriptions and job values since 1985. Our clients are able to evaluate and collaborate on similar and dissimilar jobs with the computerized position analysis questionnaire which is internally aligned with the job valuing system. This system automates the internal pay line regression configuration and analysis of pay equity by race, gender and age. Our DBCompensation software clients have saved precious HR hours when completing their internal and external compensation studies with the use of this proven human resources and compensation management tool. Our clients are able to produce comprehensive and defensible pay and pay structure analysis graphs as depicted below. 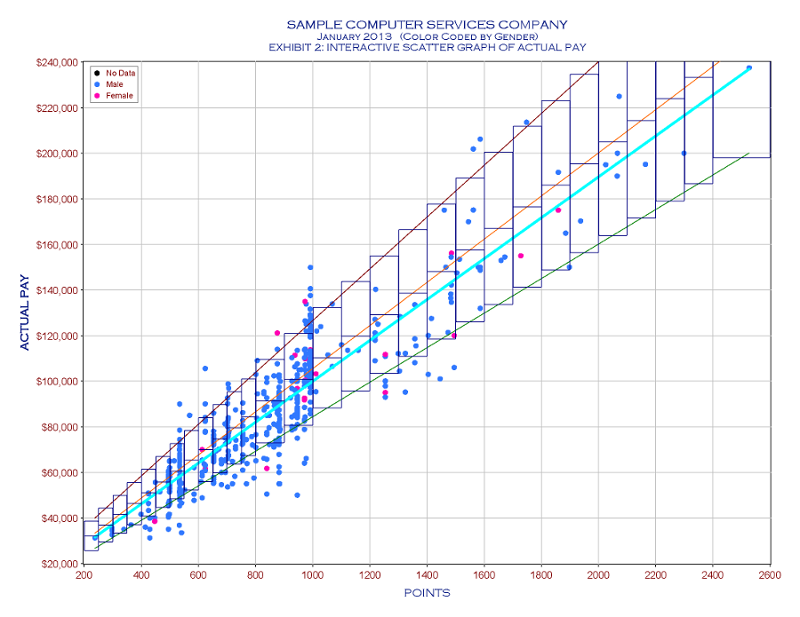 Some of the large compensation software companies state that they offer salary range development, equity analysis and pay program design, but the reality is that they do not utilize a compensable factors job evaluation process so the regression line and positions differentiator is based on large EEO classification groupings - and an OFCCP investigator would love to work with these large "Pay Analysis Groupings". We believe that these generic classifications instead of a true compensable factors job evaluation classification system generate regression pay lines that provide a false sense of reality and pay equity. JUNE SPECIAL ON DBDESCRIPTIONS SUBSCRIPTION! Bruce Johanson will be speaking at the HRSouthwest conference, Wednesday October 23rd at 7 AM. This conference will be held at the Fort Worth Convention Center. In honor of the speaking engagement, we are offering a special on DBDescriptions. For a limited time, $245 per new user for a one year subscription. 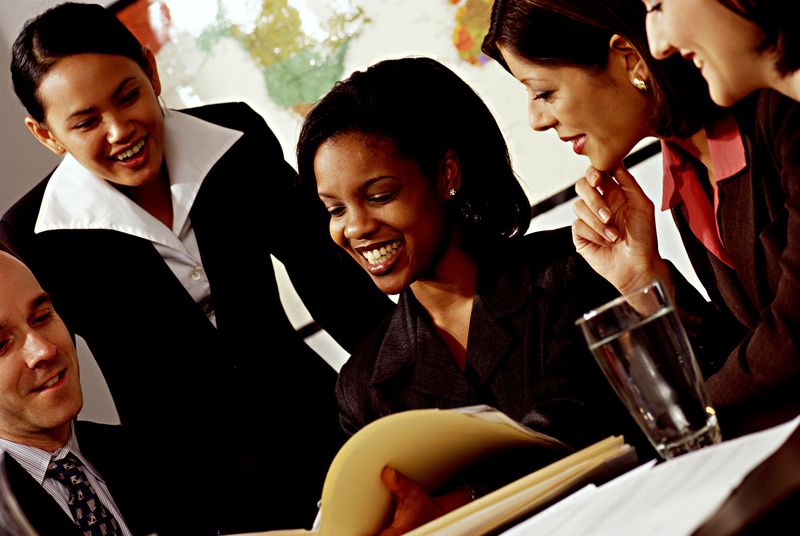 Complete a trial job description on DBDescriptions by clicking on the following link www.DBDescriptions.com. Bruce and I were surprised at the number of compensation professionals attending the recent WorldatWork conference that expressed concern with not having ADA compliant job descriptions.